What is the remaining mission task? Rebecca Lewis, daughter of Ralph Winter, released an amazing video that describes the remaining mission task in just six minutes. Click here to see this amazing video. One of my team mates worked for nearly a year to compile the data supporting the graphs in this video. 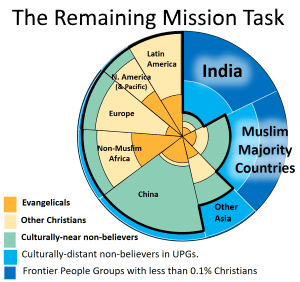 An article in the International Journal of Foreign Mission, “Clarifying the Remaining Task,” explains the new pie chart in detail and provides all the data. Click here to read the IJFM article. Lewis’ statement, “Out of 30 missionaries sent, roughly ONE goes to the unreached and frontier people groups,” challenges us to consider our deployment of mission workers and to pray fervently that “the Lord of the Harvest to send out laborers into His harvest field” (Luke 10:2). These are some of the questions posed at the beginning of the 2017 National Church Planting Processes Survey. This first-of-its-kind study aimed at assessing the effectiveness of whole-nation disciple making process, sometimes referred to as Saturation Church Planting (SCP) or DAWN Initiatives. The results of this research exceeded expectations, yielding more significant findings than anticipated. “Seminars and Consultations” is the second most significant factor contributing to an effective national-wide disciple making process. These insights, which when acted upon, can guide the development of effective nationwide disciple making processes. A more thorough explanation of these seven insights is available here, including practical applications of how this research guides the development whole-nation disciple making processes as we move toward AD 2050. See my earlier posts for other perspectives on this study. Earlier this month I was in Nairobi Kenya for the 8th Lausanne International Researchers’ Conference. It certainly was highlight for me to arrive in Nairobi on my birthday — my first time in Africa — and to present a paper on “The Vital Role of National Leadership in Advancing National Church Planting Processes.“ You can view the paper here. In 2017, a key ministry partner requested my help to evaluate the effectiveness of National Church Planting Processes on a global scale. With the help of my co-workers on the Global Research Team, I created an online survey, and over 110 workers with significant experience participated. In February I will travel to Berlin to interact with a group of global church planting catalysis to share the major findings of this study and new insights pertinent to advancing national church planting processes around the world. In addition, I’ve planning a series of additional reports focused on related topics. Reports and updates will be posted at www.OCresearch.info. I consider this the most significant research project I’ve been involved with to date. It has been a super opportunity to collaborate with experts in the field of mission research as well as those with significant experience in advancing national church planting processes. If each person who completed the survey has just of ten years experience (highly likely), this totals over a millennium of experience! A National Church Planting Process is based on the DAWN vision, which became a major strategy for world evangelization in the 1990s. DAWN, an acronym that stands for “Disciple A Whole Nation,” has biblical roots in Matthew 28:19-20. The DAWN vision, akin to “Saturation Church Planting”, grew out of Jim Montgomery’s experience in the Philippines as an OC missionary. In the 1970s Montgomery, along with Donald McGavran, played a key role in motivating and mobilizing Philippine church leaders to set a goal of establishing an evangelizing congregation in every small community of the country by the year 2000. Projections estimated that this would require 50,000 churches, quite an audacious goal when there were roughly 5,000 evangelical churches in the country! But by 2000, the Philippines had more than 50,000 evangelical churches – though not every small community had an evangelizing church. DAWN became a highly significant world evangelism strategy during the final decade of the 20st century. In 1985 Montgomery founded Dawn Ministries to promote national church planting processes in other nations. Montgomery’s book, DAWN 2000: 7 Million Churches to Go, published in 1989, was key in spreading the vision globally. In the 1990s the DAWN strategy was championed by the Lausanne Movement, the World Evangelical Alliance as well as the AD 2000 and Beyond Movement. DAWN Report #21, a special AD 2000/GCOWE edition, lists 68 countries with active projects and mentions 68 additional nations seriously considering a DAWN-type project. A 1998 report disseminated by the World Evangelical Alliance for the Ibero American DAWN Congress ’98 provided information about DAWN projects for more than 60 countries. In 2002, Dr. Steve Steele, then Dawn Ministry’s CEO, presented a paper at The Billy Graham Center Evangelism Roundtable. Steele mentions “150 or so DAWN national Projects.” Roughly a million new churches were planted in the 1990s as a result of these projects. Thus DAWN had a significant impact on world evangelization in the 1990s, which continues into the third millennium, even though Dawn Ministries has essentially ceased to function. Although numerous studies of particular DAWN country projects have been undertaken, we were not familiar with meta-evaluation of DAWN initiatives. Thus we undertook the challenge of a multi-national evaluation of DAWN initiatives. In 2018 we continue to gather insights from those involved in national church planting processes. If you have been or are currently involved in advancing a national church planting process, you are invited to participate in this online survey. We value your input. The survey should take 10 to 20 minutes to complete and your responses are confidential. Click here to participate in the 2018 National Church Planting Process survey. Last week I joined four other colleagues from One Challenge in Texas for the Mission Information Workers Conference. This gathering was sponsored by the Community of Mission Information Workers (CMIW), the Summer Institute of Linguistics (SIL), Harvest Information System (HIS) and the Seed Company. The program included 14 TED Talks (Technology, Entertainment & Design). A number of the speakers punctuated their TED Talks with insightful quotes. Here are my favorite top five five. Let’s start with two quotes attributed to Albert Einstein. The point made by management expert, Peter F. Drucker, merits some thought. The words of St. Bernard of Clairvaux highlight the motives for seeking knowledge. Some seek knowledge for the sake of knowledge: that is curiosity; others seek knowledge that they may themselves be known: that is vanity; but there are still others who seek knowledge in order to serve and edify others, and that is charity. And here is a final quote by Lord Kelvin, who champions quantitative research. So these are my top five quotes from the conference. Do you have any favorite quotes that guide your use of Mission Information? Feel free to share them here. For 35 years I’ve intuitively been involved in mission research, first for a local church, then for a whole city, then a whole country, and now for a whole mission & the whole world. Over the years these are some of the questions that have come my way about mission research. Why is research important to Christian missions? Why should we make an effort to count the believers and number the churches? What does a mission information worker do anyway? Based on my limited experience and understanding, I’ve tried to explain how research is helpful to Christian missions. But in recent years, I’ve discovered that my mission organization, One Challenge, has numerous “research giants” who have greatly helped me understand and articulate the importance of research to Christian mission. In this article I wish to focus on the contribution of two of these research giants, whose complementary insights, though made a generation apart, have greatly shaped my understanding of missionary research and what a mission information worker does. Like Isaac Newton, I can see further by standing on the shoulders of these giants. Back in 1988, Paul Yaggy, one of the early champions of mission research in our organization, described four categories of mission related research. The following descriptions come from his Position Paper on OC Research. The first is those who are accumulating factual data only. This includes demographic information regarding both the context and the institutional church. Such information is published or maintained for access and use by others as they desire. The second category is made up of those who do such analysis to show trends and to define potential places of ministry which are in need of pioneering effort. The third category consists of those who not only do trend analysis, but seek to discover to a limited degree some of the factors which cause these trends. These organizations publish papers along with their statistical data and analysis to assist whoever is interested in such information. A fourth category in which OC finds itself is organizations which do all of the above but carry the analysis of the factors to greater depth with the primary purpose of understanding both the institutional church and its context with regard to past and present ministry effectiveness as well as its potential for meeting identified needs in the future. The primary output of such research, as far as OC is concerned, is a basis for decision making for its own ministries in serving the church and for carrying out the other three categories of OC’s basic strategy of motivation, training, and mobilization. For some time this writer has wrestled with a succinct way to describe Yaggy’s fourth level. Technically speaking, what information workers do can be classified “applied research.” — but that does not seem to excite much passion nor effectively communicate with church people what we do. I’m more enthusiastic about “decision making for disciple making” as a mission information worker’s goal is to provide the body of Christ with information to assist decision making for effective disciple making. To summarize, we might also say that the task of mission information workers at levels one and two is to determine the facts. At level three, mission information workers seek to determine factors shaping the trends. And the focus of level four can be called decision making for disciple making. Jumping ahead thirty years or so, our current director of research set Yaggy’s four categories of mission research in the context of an information model known as the “DIKW Pyramid” or the “Knowledge Hierarchy”. (See https://en.wikipedia.org/wiki/DIKW_Pyramid for a general overview and further references.) This model further elaborates what mission information workers seek to discover at each level of research. The acrostic DIKW is short for Data, Information, Knowledge and Wisdom. These four words nicely describe what the mission information worker seeks at each level. For our purposes we will call this the Mission Information Pyramid. Let’s use the mission information pyramid to explain the importance of mission research and what a mission information worker does. At level 1, the mission information workers gather factual data. This may involve collecting new data or finding usable data others have gathered. Because we don’t want to re-invent the wheel, library research will able be done to discover what others have already done in the area under study and to obtain correlative data. To gather new data, online surveys, questionnaires, censuses, participant observation, focus groups, interviews, and ethnographies are some for the various tools information workers may use. At this level, missionary research is not glamorous; it is just plain hard work. At level 2, the data is organized and analyzed to get usable information. At the level 2, the mission information workers seeks to answer who, what when and where type questions. As Yaggy said, analysis will show trends and places for potential ministry. The mission information worker’s analysis may show annual or ten year growth rates for conversions or church growth, the percentage of a population that is Christian, or the ratio of churches to population. Charts, graphs, data tables, infographics or maps along with written reports or oral presentations may be used to convey findings. Aha! Here we have some information that may be useful. At level 3, mission information workers seek knowledge, insight and understanding of the past and present. Yaggy also pointed out that here we want to discover the factors shaping the trends. I like to say that that at this level we seek answers to the how and why questions. At this level, interviews with insiders are essential. Case studies may be done to show models of effective disciple making, or the case studies may show what is hindering the process of making disciples. Focus groups and participant observation are also useful means to gain insight. The mission information workers will also consider contextual factors that are helping or hindering the disciple making process as factors outside of the institutional church often affect trends. These factors be rooted in historic, religious, or geographic realities or imply social, technological, economic, ethnic, political or environmental factors, to name a just a few. This is where an outsider may have an advantage, as a broader or fresh perspective may enable an outsider to see things that an insider takes for granted. Asking good questions and listening, along with critical reflection, will yield important insights. This is where mission research becomes exciting! There are three broad areas where mission research informs our decision making. Second, because we identified needs in the church and in the target communities, we will seek to send the right people to the right places doing the right things to meet those needs. Let’s draw upon the “five-fold ministry” found in Ephesians 4 as an example. We (hopefully) will make a case for sending evangelists to the areas that are “ripe for harvest” where God is at work or sending apostles (aka missionaries) to places and peoples that still have need of pioneer works where “Christ has not been named” (Romans 15:20). We will send pastors and teachers where the churches need strengthened. And perhaps prophets (or to draw upon an old term “exhorters”) will go and stir up the church to greater love and good deeds where sin, falsehood or love of this world has weakened the witness of the church. Third, since our case studies likely identified out more and less fruitful approaches to ministry, we will need to evaluate our own ministries and sharpen our ministry practices, abandoning less fruitful or no longer relevant ministries and making fruitful ones evermore so. We need God’s wisdom for all of these (James 1:5). If the information itself has not driven you to your knees in prayer, the challenge of implementing change certainly will! In conclusion I am indebted to Paul Yaggy and the current director of OC Research. By standing on the shoulders of these “research giants”, I’ve been able to see further. I hope that their insights, and maybe a few of my own, have helped you better understand the importance of research to Christian mission and what a mission information worker does.